The previous reports from this laboratory have demonstrated the existence and growth of endosymbiotic actinidic archaea in human population which has been related to disease states like schizophrenia, autism, metabolic syndrome, cancer, autoimmune disease and degenerations. The overgrowth of endosymbiotic actinidic archaea results in neanderthalisation of humans. The overgrowth of endosymbiotic archaea results from the growth of homo sapien civilization. The homo sapien civilization results in industrialization and production of carbon dioxide, a greenhouse gas. The homo sapien civilization also results in widespread use of electronic devices like mobile phones and internet producing interconnectivity and a globalised world. The resultant low level EMF pollution also results in endosymbiotic archaeal growth. Carbon dioxide is a major greenhouse gas whose effects are long term but moderate. The archaea are methanogenic organisms. Methanogenesis results from the production of methane from carbon dioxide and hydrogen. Methanogenesis can also occur from formate and acetate. Acetate is the end product of carbohydrate, protein and lipid catabolism in humans. The human nutritional sources get metabolically converted to acetate and acetyl CoA which can enter the citric acid cycle and mitochondrial oxidative phosphorylation. The presence of endosymbiotic actinidic archaea results in conversion of acetate to formate and methane. It also results in conversion of the ubiquitous carbon dioxide and hydrogen to methane. Thus the human body due to endosymbiosis by archaea becomes the principal source of methanogenesis. Methane is an important greenhouse gas. The effect of methane is short term as compared to carbon dioxide. Methane being a larger molecule can produce absorption of long range radiation and its global warming potential is 29 times that of carbon dioxide. Thus the principal culprit for global warming and eventual catastrophic extinction of human society is methane produced by human endosymbiotic archaea. The archaeal overgrowth due to global warming can affect ocean beds and lakes. This results in warming of the ocean and instability of methane hydrates in the ocean bed releasing methane. 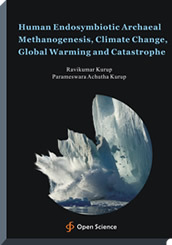 The arctic permafrost decays releasing organic carbon which can be a source of methanogenesis by archaea. The study was conducted to evaluate the growth of actinidic archaea in humans. Climatologists, Environmental Biologists, Virologists, Epidemiologists, Physicians, General Public.